My current phone is a Lenovo/Motorola Moto Z2 Play, which I bought last year to replace my Moto Z Play. 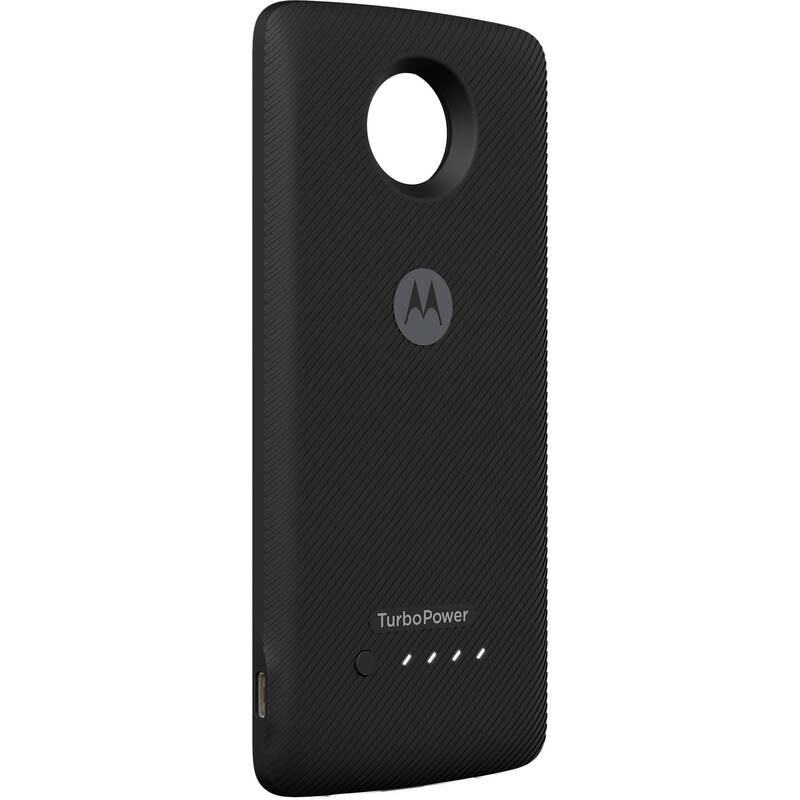 One of the features that drew me to the Moto Z series was the modular accessory system, which allows accessories to be attached to the back magnetically. I have the projector, a speaker, and the wireless charging mod, but my most used mods are my battery packs. The Turbopower Pack that came out last year improved vastly on the battery packs from the year before, sporting a 3400mAh capacity, a dedicated USB C charging port, and a fairly slim design considering the capacity. I’ve used this battery pack a lot, and between my heavy daily use of my phone at work and long Pokemon Go or Geocaching sessions, it’s a very useful accessory and worth more to me than all the (to me, pointless) features they put in other phones these days. Problem is, using the battery means I cannot use a wallet case. Initially I solved this problem by first modifying an off-brand wallet case, combining it with a style shell (a decorative magnetic shell for the back). The result is in the image to the right. The original wallet case was just an adapted generic design, using a plastic shell to keep the phone attached to the wallet. By making it compatible with the magnetic attachment system, I could more easily switch between the wallet and the battery, carrying the empty wallet on the side when using the battery. This was a solution, but not a good one. It meant carrying a separate wallet again whenever I used the battery, and carrying an empty wallet case as a wallet seemed dumb. I started using the battery less and less as a result, leaving me checking battery levels and plugging in on occasion. I have a rule when it comes to the phone I use, which is that it needs to let me use it however I like without worrying about battery life. With everything and its grandmother turned on (including location scanning for AutoLocation) and mobile hotspot on and in use 8+ hours a day, that’s no easy task. As such, I finally decided it was time to attempt a DIY project that I had been wanting to for a while: integrating the magnetic battery into a wallet case. As luck would have it, the local store where I had bought the wallet case had one left (it’s discontinued, and I like this particular case’s general aesthetics). The case is for the slightly thicker Moto Z Play, so the original modded wallet case was absolutely perfect with the Z2 Play and style shell being about the same thickness as the Z Play and the original plastic shell that was in the wallet case. There was no way I would fit the battery and the Z2 Play inside the original pleather case without it being very off center, which would be an issue for the camera cutout. Covering the back with the pleather cover would also block access to the battery indicator button and LED. As such, I knew I had to cut off the back of the wallet case and glue it directly to the back of the battery. Finding the right glue and place to put it took some trial and error, and the scuff marks you see along the inner bend of the case are a result of mistakes being made and then fixed with a Dremel. It looks rough, but doesn’t affect use. At some point I may get an air-drying fabric marker and color it in a bit, but this was never going to look like something factory made anyways; for that I have neither the patience nor the inclination. In the end, about a 1.5 cm piece of the pleather cover extends around the back, where it’s glued in place, and there is also glue along the side of the battery. For anyone interested in DIY software, the image to the right shows my KLWP homescreen, which actually has a battery indicator for the extra battery (the far right smaller circle around the clock). It pops up when any Moto Mod with its own battery is connected, same as a similar icon on the opposite side of the screen does for my Bluetooth headphones. The back is where things get really rough. After several attempts to make the transition from glued-on pleather to the logo-ridden, ridge-patterned battery back look good, I gave up. I ended up covering the entire back in Sugru, which didn’t come out even, but it’s still vastly better than the half-covered original battery back. Again, I knew the result would be a bit rough, and with the final back side being very comfortable to hold, I’m willing to leave it like it is. Between the battery level indicator button and LEDs, the camera cutout, the ridge patterns on the original back, and the magnet for the clasp, I do not have the patience to make it any better. As for thickness and weight, adding a permanent 3400mAh battery to a wallet case obviously adds some bulk. I’ve never cared about the thickness or weight of a phone, however, and actually prefer to know by feel that my phone is with me. Furthermore, with the battery and a thin layer of Sugru replacing the plastic shell and pleather back of the original wallet, the end result isn’t as bulky as you’d think. Having the phone magnetically attach saves a ton of space, and makes it easy to remove. I could have left it at that, but as I was taking a final look at my creation, a thought struck me: modular attachments for my modular phone’s case. Last year, before I got the Turbopower Pack, I used an Incipio battery pack that I had glued some Lego on to make a modular system for my Pokemon Go Plus. It allowed me to stick the Go+ to the back and operate it with the same hand in which I was holding the phone. When an OS update completely broke the Go+ across the entire Z series, an issue that still isn’t fixed, I bought the third party Go-tcha instead. I’ve been using it with an armband, but missed having it attached to the phone. I’ve considered a Lego solution for it as well, but its charger requires a part of it to be left uncovered, leaving me with little surface area for a secure connection. Not an unsolvable issue, just not one I’d gotten around to looking at. In a moment of pure brilliance/stupidity (time will tell), I remembered the many watchbands I had left over from previous smartwatches, some of which have a very handy quick release mechanism. I grabbed an old Sony Ericsson LiveView, which has a plastic clip that connects it to a watchband, and used my Dremel to cut off the plastic attachment points for the watchband. I glued these into the little finger groove on the bottom of the battery (which is redundant now that I have the pleather cover to help me get the phone off the battery), using some epoxy glue to create a (hopefully) solid bond. I then cut off one end of an old watchband with the before-mentioned quick release mechanism, and glued it to one of the spare armbands I had for the Go-tcha. I trimmed the latter so that it’s in effect a silicone case for the Go-tcha now instead of an armband. The end result is a modular attachment system that uses quick release watchband pins to provide a low-profile way to attach something to the bottom of the case. Time will tell if this is a reliable system, but if it’s not, I can easily remove it. Knowing the abuse a watchband pin needs to endure on an actual watch, coupled with the elasticity of the watch band, I hope it will survive in my pocket. When not in use, the two plastic pieces that stick out the end won’t be in my way, and I also have the option to expand with other accessories in the future. For now, this allows me to snap the Go-tcha onto the phone when I need it there, and leave it off when I don’t, keeping everything about the Go-tcha intact and compatible with both the charger and armband. This DIY project isn’t the prettiest out there, but it’s very functional. The resulting wallet case allows me to roughly double my phone’s battery capacity, attaches magnetically, can be charged individually, and even has a solution to my “I don’t want to have the Go-tcha on my arm”-problem. It looking a bit rough just adds to the charm in my book.